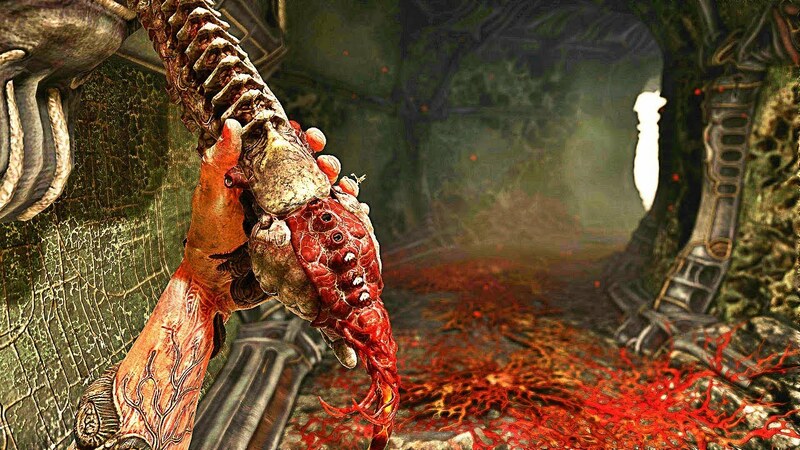 Scorn will feature a multitude of weapons. However, we do not have specific information on just how many there will be and what particular types will be available. New weapons will be acquired within the confines of new areas, with the presence of of ammo being kept scarce at best as described by the initial game description. The trailer features the humanoid protagonist pointing what looks to be a bio-engineered pistol with an exchangeable firing chamber and barrel mechanism at the eerie creature. Judging by what the 2017 trailer has shown, its ammunition appears to be resembling small pellets of which the character can carry up to six shots in a 'clip'. Exactly how the pistol fires is somewhat odd, due to it being capable of allowing a single shot to be fired quickly or as a charged shot, which could allow the character to take out opponents at further ranges with increased accuracy. Another weapon that has been shown in the 2017 trailer would be the bio-engineered shotgun, bearing its own exchangeable firing chamber upon the same grip as the pistol. Its ammunition also consists of pellets, albeit, ones at a larger size than that of the pistol's. The shotgun can store up to three of these pellets at any given time. As is the nature of shotguns, the weapon doesn't have an awful lot of range but is made up for by its higher damage output and wider spread. This page was last edited on 25 January 2018, at 17:36.